Cuttlefish have the most acute polarization vision found in any animal. In a study published in Current Biology, researchers report cuttlefish were even more sensitive to polarization than previously believed. Polarization is one aspect of light, as are color and intensity. You might be familiar with it if you've ever owned polarized sunglasses. Polarized light creates a glare when it hits large, flat surfaces, such as a stretch of road or a body of water. Light that would otherwise be scattered in all directions is reflected off these large surfaces oriented in a single direction. Polarized sunglasses block out most of this reflected light to combat the intense glare. For animals that can perceive polarized light in a more nuanced way than humans, it adds another dimension to vision. They can see the angle at which the light is reflected and polarized. The most acute polarized light perception in any animal was believed to be limited to differences of about 10 to 20 degrees. But the experiments from a team of researchers from the University of Bristol and the University of Queensland show that the mourning cuttlefish (Sepia plangon) responded to changes of polarized light orientation of just one degree. 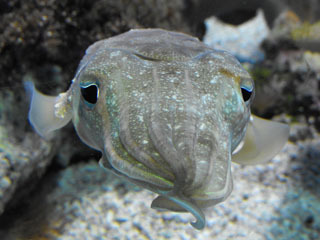 The researchers played videos of "looming stimuli" to the cuttlefish on modified LCD computer monitors. The stimuli, such as an expanding circle, were meant to suggest approaching predators. The images were modified to show changes in polarized light orientation only, instead of changes in color and intensity. Then the researchers watched for changes in skin color patterns to determine if the cuttlefish could perceive very small changes in polarization angle. Cuttlefish respond to the slightest movement with a quick change of color to blend in to their surroundings. The cuttlefish saw, and reacted to, changes in the angle of polarized light of just 1.05 degree. Cuttlefish may use the polarization of light much like how we use color. This dimension of light could be essential in their underwater world. The researchers modeled how the world might look to a cuttlefish with high-resolution polarized vision by creating images that used colors to represent changes in polarization. These showed that there is a wealth of information available in the polarization dimension — if you have the right type of vision to see it. This polarization acuity may have evolved because cuttlefish and other cephalopods don't see color very well, if they see it at all. This lack of color vision was puzzling to scientists trying to understand how these animals could be masters of camouflage, able to blend in seamlessly with their surroundings. These findings suggest that cuttlefish may use polarized light to create their camouflage.